The Model 8040 is one of Chandler Engineering’s most proven consistometers. Hundreds of units are in operation globally. Experience with these rugged instruments has demonstrated that their service lifespan can easily exceed ten years with normal, routine maintenance. Every unit is tested extensively at the factory with standard cement to ensure that the instrument is a completely and satisfactorily operational unit. The Model 8040 Pressurized Consistometer is simple to operate with all of the operational controls conveniently located on the front panel. The unit is designed so that closure, heating and pressurization can be achieved quickly. The slurry cup drive automatically rotates the cup at the required, standard rate of 150 rpm. Indicators for test time, consistency, pressure and temperature are readily visible on the front panel of the unit. A chart recorder automatically tracks the temperature and consistency measurements during a test. Programmable temperature and pressure controllers are capable of controlling multi-slope temperature or pressure gradients during a test. The usefulness of the Model 8040 Consistometer is not limited to the standard testing of cement thickening time. 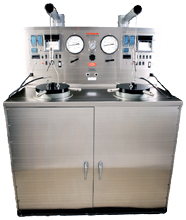 It can also be used to prepare slurries for other tests such as measuring free water content, testing for fluid loss or rheological properties and viscosity. For enhanced research and testing capabilities, the Model 8040 can be equipped with an external chiller for performing tests for deep-water temperatures.